The options in your Public Spaces Settings allow you to customize the layout of the availability grid on the public space bookings pages. Changes here will apply to the public bookings pages for every location. Category Selection: this sets the default category filter applied to your space booking pages. Show the First Category at the Location: by default, the first category's spaces will display when you initially visit each location's booking page. Show All Categories: by default, each location's booking page will display all spaces, grouped by category. Visible Duration: this determines how many days are visible at one time in the booking grid. Let the System Dynamically Determine the Duration: this option will use your location and category settings to determine an appropriate number of days to display at once. When enabled, users will be able to browse availability times for multiple days. Show a Single Day Only: this option will only display one day's availability at a time. 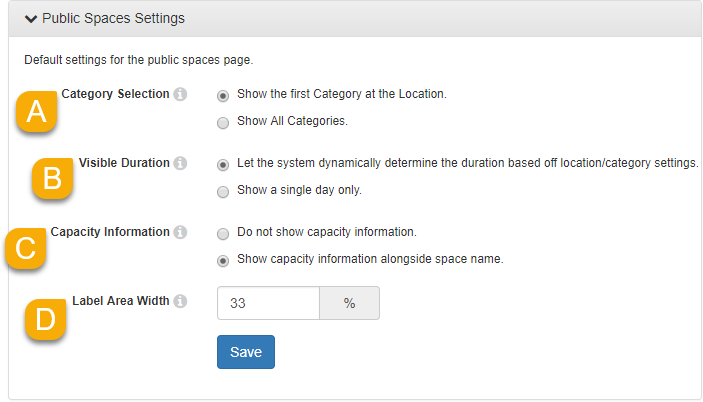 Capacity Information: this allows you to show or hide each space's capacity. Do Not Show Capacity Information: this will hide the capacity information from the booking grid (though users can still see a space's capacity by clicking on its Info button). Label Area Width: this allows you to control the width (as a percentage value) of the availability grid's first column, which displays the names for each space. If you have spaces with longer names, increasing the width of the label area can help the names display without having to scroll.